The De Zeeuw–Van Dishoeck Graduation Prize for Astronomy, established to encourage young talent in astronomy in the Netherlands, has been awarded to Laura Driessen of the University of Amsterdam. The award was presented at a ceremony in Haarlem on 27 November 2017. The award, which consists of a certificate and a cash prize of 3000 euros, is awarded annually to the best master’s thesis in the field of astronomy written by a student studying at a Dutch university. 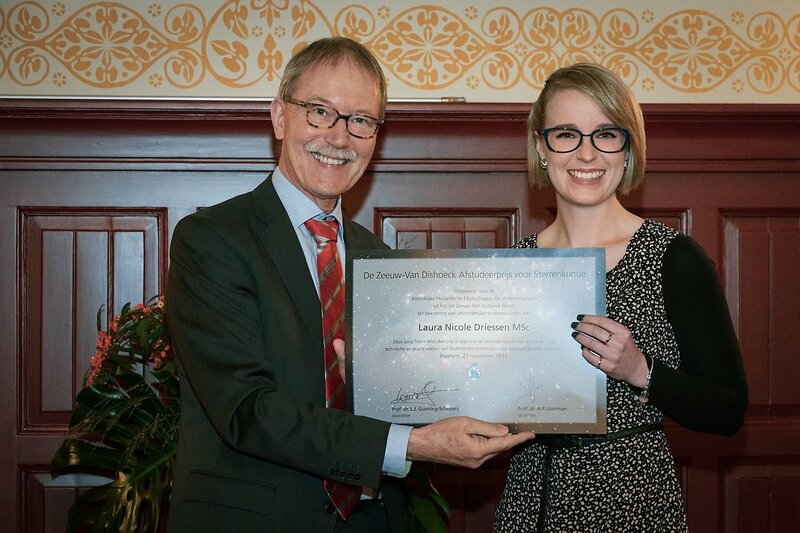 Laura Driessen received the prize for her master’s thesis study on supernova remnants and pulsar wind nebulae. Laura is now studying for a PhD in Manchester, United Kingdom. The prize fund was established by former ESO Director General Tim De Zeeuw and Ewine van Dishoeck, Professor of Theoretical Astronomy and Professor of Molecular Astrophysics respectively, at the University of Leiden. The prize was first awarded to Job Feldbrugge, in November 2014. The prize is administered by the Royal Holland Society of Sciences and Humanities (KHMW), the oldest learned society in the Netherlands. Founded in 1752, KHMW aims to advance science and build a bridge between science and society.